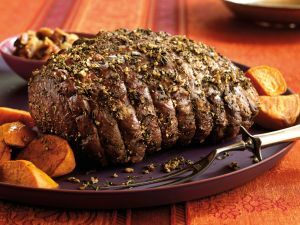 Herbed Beef is a Peruvian food recipe with rice and spices. Heat a cast iron skillet over medium-high heat and brown the meat on all four sides. Heat the oil in a large skillet over medium heat and sweat the garlic and the ají amarillo paste for 3 minutes. Dissolve the bullion powder in ½ cup water. Add all the remaining ingredients to the skillet including the browned meat. Cover with a tight fitting lid and cook over low heat for 1½ to 2 hours. Add beef broth to the pan if the liquid evaporates completely as this will dry out the meat. Heat the oil in a large saucepan over medium heat. Sweat the garlic until it is fragrant. Add the rice, water, and season with salt to taste. Cover and cook for 20 minutes. Let the rice stand covered for an additional 10 minutes. Fluff with a fork. Sauté the Peruvian corn in butter, season with salt to taste, and mix into the rice. Slice the meat crosswise into serving pieces and serve with a generous amount of herbs, broth, and the warm rice on the side.